A routine business deal goes awry when a spiteful drow noble seizes a shipment of weapons destined for the Starfinder Society. The PCs are sent to the gloomy world of Apostae to retrieve the stolen arms. Granted 24-hours of diplomatic immunity for any actions taken against the thief, the PCs strike at the rebellious drow noble and retrieve the shipment. Whether through guile or sheer force, the PCs must prove that the Starfinder Society is not an organization to trifle with. A Night in Nightarch is a really neat concept. The Starfinder Society has a weapons supplier on Apostae - they're buying weapons from the drow! 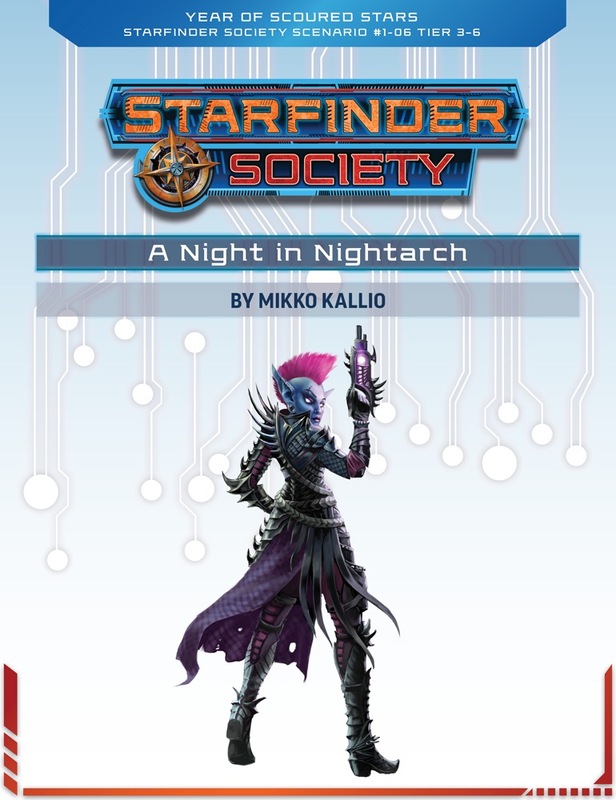 When a scheduled delivery is interrupted, its up to the Starfinders to find out why, navigate the tangles of drow society, and secure the delivery. Of course, its not going to be that simple. The back half of this scenario is a drow base that ostensibly we should be trying to infiltrate. But wow does the scenario assume you'll want to slaughter every drow in the place. On the upper floor, there's no significant skulking about necessary- the enemies are spread about, don't meaningfully patrol, are easy to defeat, and there's little that we're even meant to secure or interact with up here to find the weapons cache. On the bottom floor, there's absolutely no way to complete your objective quietly. You HAVE to fight multiple waves of orcs no matter what you do. Furthermore, despite the first half of the scenario being about prepping for your assault, no plans you make ahead of time matter. The location of the weapons is practically highlighted with a glowing beacon once you get to the right map, and completely unknown before then. Once you reach the drow base, getting full rewards expects you to search every room and beat every guard, a strategy that stands in direct opposition to your stated goal of 'get the weapons cache and split'. Really obvious logical issues, like: 'This is a whole shipment of weapons, how are we going to get it out when I can't carry that much bulk?' The scenario actually solves this FOR you by giving you a forklift in the final room, but there's no way to know this exists while you're outside and planning. For a Drow scenario, disappointingly no one betrays you! In comparison to how the drow are portrayed in PF1E and older fantasy games, there's a distinct lack of evilness to the ones in this scenario. The plot never really goes anywhere - you go in, find the weapons right away, fight some guards and a pathetic party kid, and you're done. There's a lengthy skill check portion in the beginning that helps you accrue advantages for your inevitable assault on the drow warehouse base. Some of these seem pointless, but others are pretty neat. Fun drow flavor, like the fleshwarping lab and drow heavy metal music. Some fun, fairly challenging encounters in closely chained string. The warehouse makes for a good battle map: elevation changes, traps, obstacles, and plenty of room to maneuver. The auto-forklift as a moving hazard was excellent. I absolutely love the premise of this scenario. It’s got some fun NPCs to interact with, awesome drow artwork, and does a great job of setting an atmospheric tone with only a few short sentences. Skills are really important for this one. I really enjoyed that the mission was on a timeframe, and the quick mechanics that were used to speed up/determine time. The office levels were well-detailed and organic. It had character, which was really nice. I loved the little details hidden here and there, like the advertisements –- particularly the one featuring Zo!’s reality tv show! There were multiple ways to go about one of the encounters which allows for players to go in guns blazing or infiltration. The outcome of the battle doesn’t change too much from one to the other, but its nice to have the option. Allowing the players to take over the mainframe and grant themselves remote access was a nice touch that can really affect gameplay. The scenario starts off very strong, and those of you who love shady dealings and investigation will have a blast. Also, if shadowrun is your thing, you will love this! The scenario does taper off a bit towards the end, but the "zamboni" makes for a lot of fun! The plot started off interesting and the scenario just drops off. As per usual the Starfinder scenario run time is quite short. Get In, Get Out, Don't Die! I ran this for a group of five PCs at Tier 3-4. If the cover or title doesn't give it away, I will: expect drow--lots, and lots of drow, and probably not of the heroic Drizzt-type either! It's a good scenario for players who like a lot of combat, though there are a couple of skills challenges as well. It's also a long scenario, and not one that should be attempted in a super-tight time spot. A Night in Nightarch begins with the usual briefing, but this time it's from someone new: Naiaj, the bleachling gnome Venture-Captain that PCs may have met in the gala during # 1-05 ("The First Mandate"). Naiaj is a dour, straightforward NPC, but a good choice to send the Starfinders off on a dangerous mission. She explains that the Society is in desperate need of weapons given the loss of so much material during the Scoured Stars Incident, and that the group has therefore arranged to import some from the drow world of Apostae. However, before the weapons could be transported, they were stolen. The PCs' task, obviously, is to travel to the surface settlement of Nightarch on Apostae and recover the weapons without creating a major diplomatic incident. Naiaj explains that the thief is a minor drow noble named Villyth Zeizerer, but a ranking member of House Zeizerer, Ceobarn, has agreed to serve as a contact to resolve the matter. There's no drama on the trip to Nightarch, and soon the PCs' shuttle sets down in the domed settlement. I like the description of Nightarch, and GMs should try to play up its gloomy, ominous nature--this is not a place to trifle with! The meeting with Ceobarn is handled as a social encounter/skills challenge, with PCs needing to use different lines of argument and different skill checks to persuade him to help; the more successes they get, the more he'll help. The minimum he'll give is 24 hours of "diplomatic immunity" so that the PCs can get in, get the guns, and get out without further reprisals. There's a couple of cool things available if the PCs rack up the successes, like Ceobarn loaning them his personal armored transport or even his personal sniper. I like the idea of social encounters when they can be handled naturally and as an aid to role-playing, but I found this one was awkward because it's unclear if the PCs are to make an argument and then roll the corresponding skill check (some of which are unusual in this context, like Mysticism or Perception), or roll a skill check to know which argument to make. When I ran this, the RP was a bit stilted and forced, and the DCs were high enough that the PCs attempting the checks usually failed. I applaud the idea of trying to make more skills than just Diplomacy useful in social encounters, but the way it was handled in # 1-05 was better (with the players getting hints about what types of skills might impress different NPCs, and then RPing and attempting the skill check accordingly). I should add that a couple of players were frustrated by this part, as they felt their PCs had very little to offer. The next part of the session is another set of skill checks to locate where the weapons are being held (a warehouse) and potentially other pieces of information such as a floor plan, defenses, access codes, etc. GMs are instructed to handle this like the montage scenes in a heist movie, and that worked out pretty well in my session. The players are then expected to quickly plan their raid. The key issue is that there's a lot of content in this scenario, so all of this work is supposed to take no more than an hour of table-time. That's a lot to expect of RP-heavy groups (where gathering intel and planning a raid could easily take up a whole session), but I'm glad the warning was given to GMs to pass along to players about what the expectations are. One of the flaws of the scenario is that locating the weapons, gathering intel, and even getting to the warehouse are all assigned very concrete periods of time (down to the half-hour in some cases) so that the players feel like getting everything done within their 24 hours of diplomatic immunity is a crucial element of the scenario. Oddly, however, there are no stated consequences if PCs go beyond that time period! It's a false urgency that could have been handled better. The bulk of the scenario is the raid on the warehouse, which has two levels: a surface level of offices (guarded by 4 drow) and a subterranean storage level (guarded mostly by half-orcs). One of the things GMs should be aware of is that the repeated use of the term "heist" in the scenario might lead one to think about movies like Ocean's 11 where disguise, misdirection, precision timing, clever scams, etc., are the key to success. I guess it would be possible, but there's very little support or information in the scenario for that approach, with either a stealthy infiltration or a traditional frontal assault being the most plausible options for success (with the former possible only until the quite loud elevator to the storage level is activated). I have to give the writer credit: each room in the office level is fleshed out, and it has a sensible layout that even includes toilets! Groups can spend a lot of time fiddling around with various computers, etc., (the fake shell countermeasure on the control room terminal really did a number on my PCs! ), but their main goal has to be reaching the elevator and either hacking its controls or using a keycard found on one of the drow guards. Things get more interesting on the storage level. A quasit who has been mistreated by Villyth Zeizerer can be made friendly and give the PCs some advice, such as how to avoid (most of) the nasty traps that guard the place. The weapons crate the PCs are after has been loaded on a forklift robot and is guarded several half-orcs, including one who has been "fleshwarped" with a tentacle for a head! Other reviews I've read have complained that the half-orcs are so little threat that this part was a cakewalk, but that wasn't my experience--their attack roll modifiers are high enough that they wear down the PCs who may have no idea that the worst is yet to come. Once the PCs activate the forklift and start heading for the elevator, two waves of attackers (including Villyth herself) rush the trapped PCs. The PCs I ran this for unfortunately split up and had running battles all over the warehouse, leading to all but one of them getting killed! (the lone survivor, to his credit, made it out with the weapons crate and thus accomplished the mission). It's a cruel trick, quite worthy of drow, to make getting in easy but getting out hard. Overall, this is probably the most combat-heavy scenario released up to this point. PCs may not realize when it's safe to rest and recover stamina, as the natural urgency they feel to get the goods and go can lead them to keep pushing on despite getting slowly worn down. I thought the scenario was tough but fair, and provided a much-needed counterpoint to the sometimes too-easy earlier scenarios. They say drow never forget, and I'm pretty sure the people I GMed this one for won't forget it anytime soon either. Wow. That sounds awesome. Lots of flavor in there. Whoa, whoa, whoa...twenty four hours of diplomatic immunity? On a planet full of Drow? Grabs shotgun Anybody named Drizzt is getting shot. Giving PC's a carte blanche for pretty much anything is probably going to be bad idea. I for see this scenario providing us lots of infamy, which isn't a bad thing. Love it! very reminiscent of a Shadowrun style mission. I can see my players loving this one. Thanks to the infamy mechanic, that is an option—albeit an option that's not necessarily good for your character. That said, our adventure design aims not to require infamy-earning actions in order to complete a scenario satisfactorily. I'm very glad to see people are excited about the scenario! Infamy will definitely play a role in the scenario, but as John pointed out, doing bad things is totally optional. There are several ways the PCs can track down the weapons. 24 hours. I have a feeling that the PCs should be off world before that timer runs out. Why aim for infamy when this sounds like a great opportunity to.....split the party! I mean, there's so much to do right? No, we are not releasing scenarios early in November. I'm contacting the organizers to get the game revised. Thanks for asking! What maps will this scenario require? How are society characters intended to be Level 3-6 by now? 1-00 is 4th level pre-gens. It's not reasonable to assume everyone applied this to a level 1. 1-06 Forced to play a pre-gen? 3 XP from playing AP #1 = 8 XP. +1 XP from playing the free quest = 9 XP. The Quest series also provides an XP. No problem! I had to do the math a couple times myself to be sure how it all shakes loose. But playing the Quests is a great intro to Starfinder and I recommend them highly! What everyone's already said is correct! We wanted to make sure that we had something right away to showcase that we aren't forgetting about higher level content. You can expect to see a few scenarios stepping back into the 1-4 routine after this, but we'll also be introducing more and more 3-6 scenarios in increasing number. Just bought this but the download isn't appearing. Excited to read and run this! Bought this through the Starfinder Society subscription. Despite getting the paizo.com order emailed to me about 5 hours ago, this isn't in my downloads - it just says "pending" on the order. Would love to be able to read through this - am running it on Monday. Same here (except that I'll be running it on Saturday). Add another voice to: have subscription, received mail, can't download. Yeah I bought this last night and it didn't go into my downloads. I am having similar problems as the posters above, having purchased it around 2 hours prior but still having the order reading as "pending." Thanks for the link and looks like things got resolved. At least I go my PDF fulfilled now! Silly question, what is AP #1? Is that in reference to the Adventure Path Dead Suns?